Live 8 has proved to be a triumph for technology, with millions participating in the event via the web and mobiles. Almost 27 million people texted in their support for a petition asking G8 leaders to double aid and cancel debts for the world's poorest countries. Millions watched the event online and recordings of Sergeant Pepper were on sale an hour after being sung live. But videos and audio of many of the acts were also available via BitTorrent file-sharing software. The greater use of technology was one of the many ways that the Live 8 distinguished itself from the Live Aid concerts 20 years ago. Those attending the gigs and watching on TV were asked to text their support to an online petition. The 26.4 million names collected is thought to be a world record and far outstrips the 5.8 million gathered for one episode of American Idol. As well as asking G8 leaders to cancel debts and boost aid, the petition also calls for a change to trade laws to give poor nations a better chance to prosper. Many of those that went along to the various concerts on the day uploaded pictures to the Flickr online image storing system. More than 5,000 Live 8 pictures are currently available on Flickr. The events also prompted many bloggers to comment on what was going on. Blog watching service Technorati listed more than 30,000 blog entries for the concerts and said "Live 8" and "Live8" were among its top searches. This time round there were 10 gigs, not just two, and many turned to the net to pick and choose which acts they watched. AOL said that a total of five million people dipped in during the day to watch the different Live 8 gigs via its portals. The peak number of viewers was 175,000, far more than the past record of 100,000 for the Pope's funeral. At the peak, AOL said it was serving up more than 50 gigabits of traffic every second. 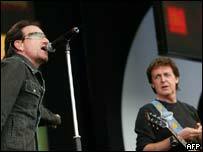 Technology also helped to get the version of Sergeant Pepper's Lonely Heart's Club Band sung by U2 and Sir Paul McCartney into online stores within an hour of it being performed. Satellite links were used to get the raw recording to Universal Music's production centre in Hanover where it was edited and mastered before being sent on to net-based music stores. Proceeds from the sale will go to Live 8. 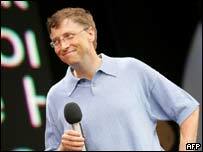 The technology theme was continued when Microsoft chairman Bill Gates took to the stage in London to add his support. "If you show people the problems and you show people the solutions they will be moved to act," said Mr Gates. If Live 8 proves successful, he said it could be the "best thing humanity has ever done". 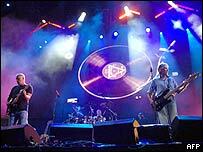 Many people have dodged the charges to get their Live 8 experience for free by turning to file-sharing site with BitTorrent links, where many recordings of the acts taking part were available to download. According to one BitTorrent search site, top of the downloads was Pink Floyd's set at the London Live 8 event. Other popular performances included Coldplay, Dido, Green day and The Who.